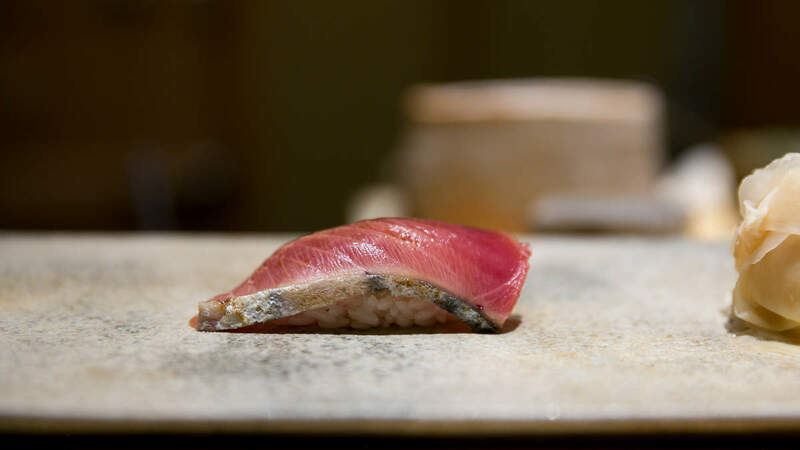 Season Late Spring (April to May) for "early katsuo," Summer and Fall for "late katsuo"
Katsuo is a popular sushi fish in Japan native to the Tokyo bay. Unfortunately, it is still difficult to find outside of Japan, in part because the flesh quickly spoils after the animal's death. Like most tunas, the myoglobin in the flesh produces a bright red hue. The taste is similar to bigeye or yellowfin tuna, but deeper as if crossed with mackerel. 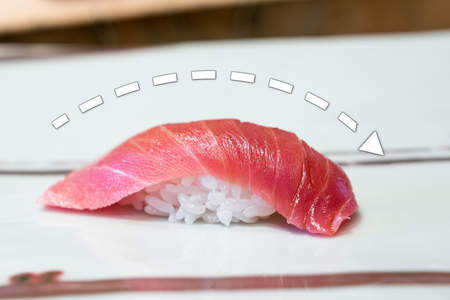 Katsuo flesh must be extremely fresh when used for sushi and sashimi, because the delicate flesh quickly degrades, making it nearly impossible to produce clean cuts. 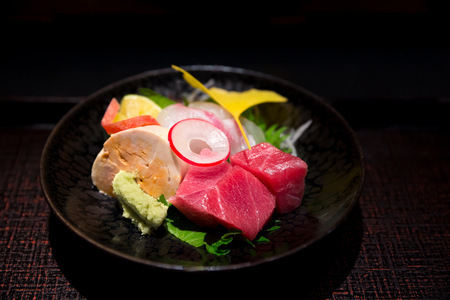 It can be served raw as sashimi or sushi as pictured above with the skin seared to make it soft. The Japanese also use katsuo to produce dried and smoked flakes called katsuobushi. There is a very good chance you have consumed katsuo because these dried flakes are infused in water to produce dashi, the soup base of miso soup. 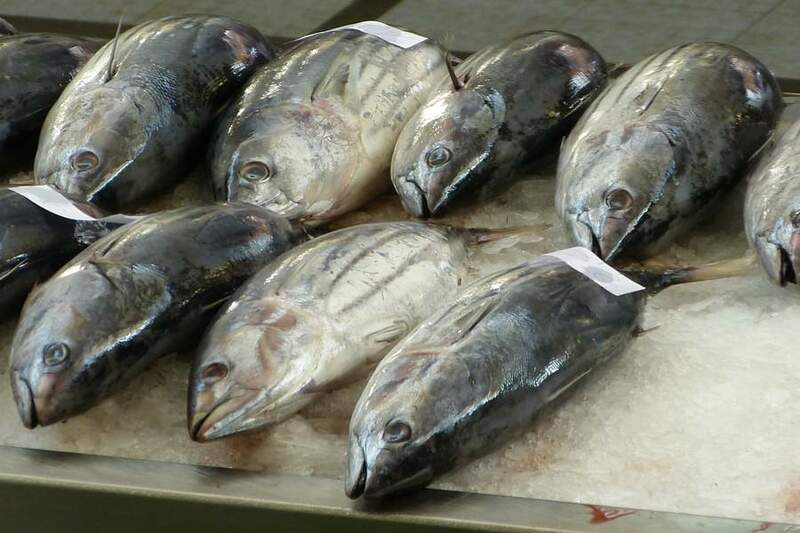 Unlike larger tunas, katsuo does not age well, so longer aging of ten days or more is uncommon. However, it is often smoked over hay to add a deep smoky flavor to the meat. 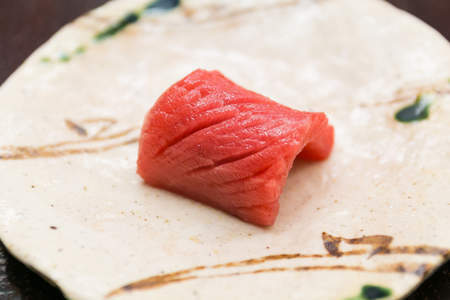 It tastes much like bluefin or bigeye tuna and would be recognizable to most as a variant of tuna. 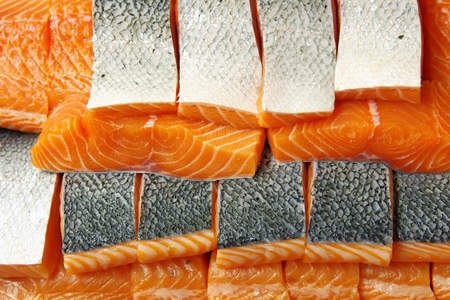 On younger fish, the skin is thin and edible once cooked either through searing, smoking, or torching. To pair with the stronger flavors, sushi chefs commonly pair katsuo with grated ginger and green onion. 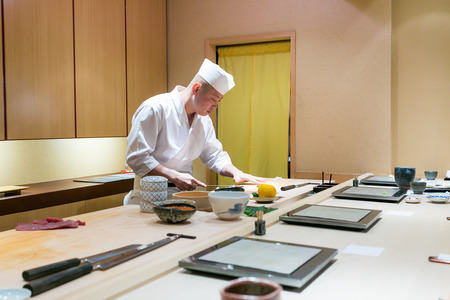 Tokyo foodies experience katsuo sushi in two phases: early katsuo and late katsuo. In late spring and early summer, the new schools of katsuo begin to mature into adolescents, large enough to harvest and yield a large quantity of meat. The flesh is young, tender, and more mild, needing only a pinch of grated ginger to accent the delicate taste. These young fish are often served with the flesh on after being seared or scalded with hot water. Towards the end of the summer, late katsuo is the mature fishes, whose larger bodies produce more meat and heavier loins. The taste is a bit stronger and a bit more bitter—in a pleasant way. 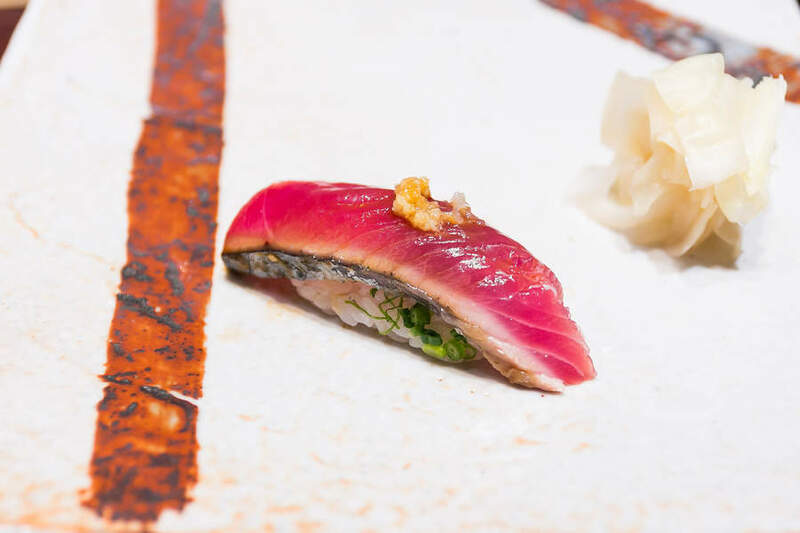 More importantly, the fish is much fattier, which lends itself to being lightly seared in tataki to bring out the robust flavors.